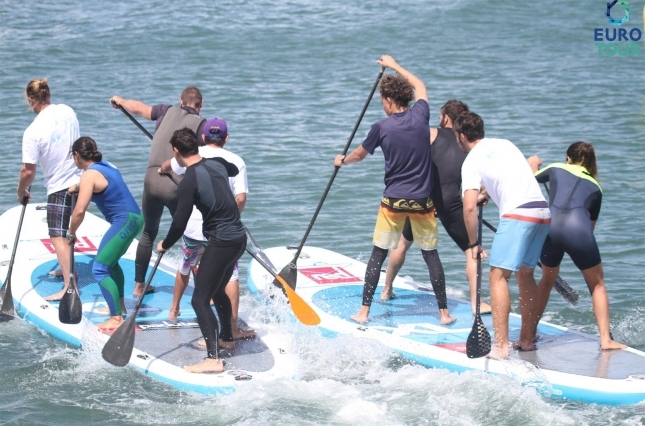 In brief: Italy’s Leonard Nika, one of the revelations of last year’s European summer series, and Spain’s Laura Quetglas have won the Port Setubal SUP Race in Portugal, the opening stop of the 2016 EuroTour presented by Starboard. 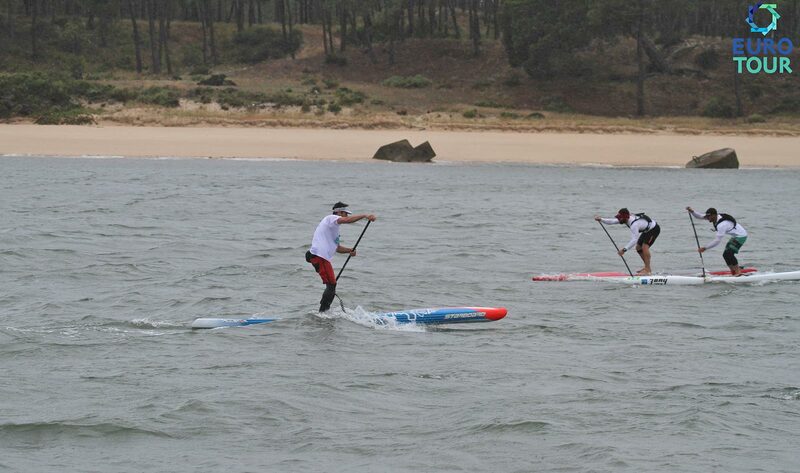 With a large, unseasonal storm front driving strong winds and heavy rain, the first stop of the 2016 Tour turned into a gritty battle that featured a strength-testing stretch of brutal upwind paddling. Leo took the win for Team Starboard ahead of a pair of highly under-rated European contenders, Branislav Sramek (JP Australia) of the Czech Republic and Pepe Oltra (SIC) from Spain. The Euro Tour continues on to Majorca and the Port Adriano SUP Race for Week 2, before the three “Headline Events,” which are set to attract a very strong international presence, begin in Week 3 with the SUP Race Cup in St. Maxime and follow with the massive Lost Mills race in Germany (Week 4) and the Bilbao Paddle Challenge in the Basque Country of Spain (Week 5). Check out the official press release below for a full recap. Saturday 7th and Sunday 8th May saw the inaugural event of the 2016 EuroTour presented by Starboard. Supported by the Port of Setubal, Setubal Municipado Participado, and Setubal 2016 European City of Sport the first day of the event saw a great attendance from elite paddlers and amateurs alike. With an unseasonal storm scheduled to hit all weekend the decision was made to move the event site across the river to the Troia Marina and Resort and we would like to thank them for hosting us at such short notice. The day of the Elite race paddlers woke to strong winds and rain clouds but the headland of Troia allowed much of the race to be sheltered from the worst of the weather. 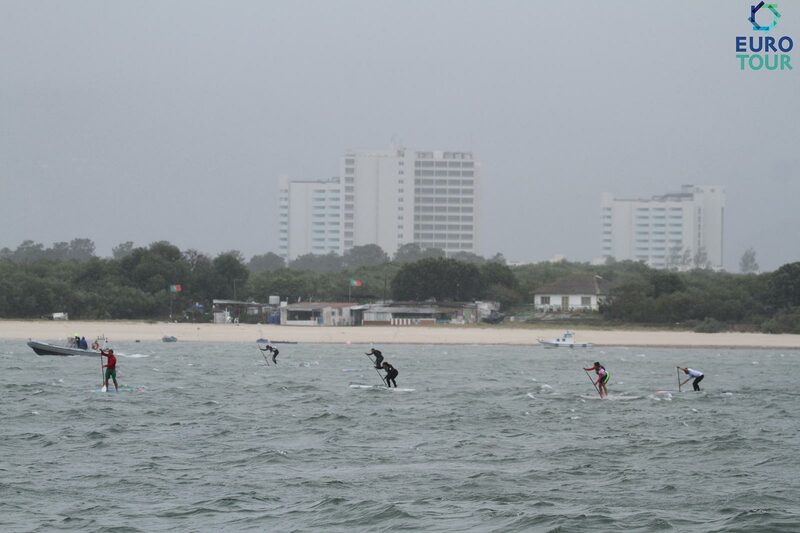 The route saw competitors hugging the coastline past the new marina, the historical ruins and long golden beaches. The course experienced all kinds of conditions for our racers, the strong wind and current of the river with the high tide pushing allowed paddlers to face downwind and upwind sections, flat and bumpy water and a whole mix in-between. metres of cable and heavy weights. However due to the great safety plan & support of Port of Stubal & Troia Marina with a total fleet of 5 boats, including the local Police, the racers were all pointed in the right direction and completed the course without incidents. A last minute board change before the start paid off for Branislav Sramek (JP Australia) who brought home second place, closely followed by Pepe Oltra Sans (SIC). The day proved successful for the travelling paddlers from Mallorca -Laura Quetglas (SIC) taking out the Elite Women with Angela Fernandes (SIC) from Portugal and a strong effort from the 14yr old Basque Cyra Palenevela (SIC). Also from Mallorca Enrique Senra (SIC) took charge of the u18 Mens, over taking several of the Elite Men’s race and coming in just ahead of James Van Drunen (Aquainc). Returning to Setubal via the ferry allowed us to take stock of the original event site being pounded by chop, the brunt of the wind and a downpour of monsoon proportions so that competitors almost needed a boat to get to the evening’s dinner of local fayre hosted by the Port of Setubal. As with all things weather related Mother Nature is an unpredictable beast and the expected downpour on Sunday didn’t materialise so the fun races provided in association with Red Paddle Co basked in glorious sunshine, harbouring once again in the lee of the Troia peninsula. 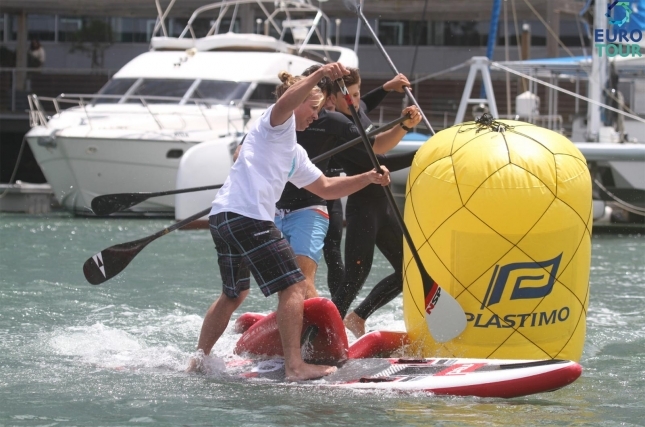 The inflatable races saw some hard fought competition from the juniors and adults alike, and smiles a plenty as paddlers took on the individual sprint races and XL Race for Glory featuring Red Paddles XL boards with teams of up to 5. The individual junior races was won by Rafael Sirvant to make his second podium of the weekend. Troia Resort played host to the awards ceremony with beautiful trophies provided by Setubal European City of Sport rounded off an awesome first weekend. Huge thanks to all the competitors, sponsors and supporters for getting this year’s season off to such a successful start. Special thanks to Fatima Evora and her team, the invaluable expertise & dedicated help all week of Ernesto Lima and his team of helpers from boat crews to volunteers and beyond. Follow us for the next 13 weeks – next stop Mallorca for the Port Adriano SUP Race.